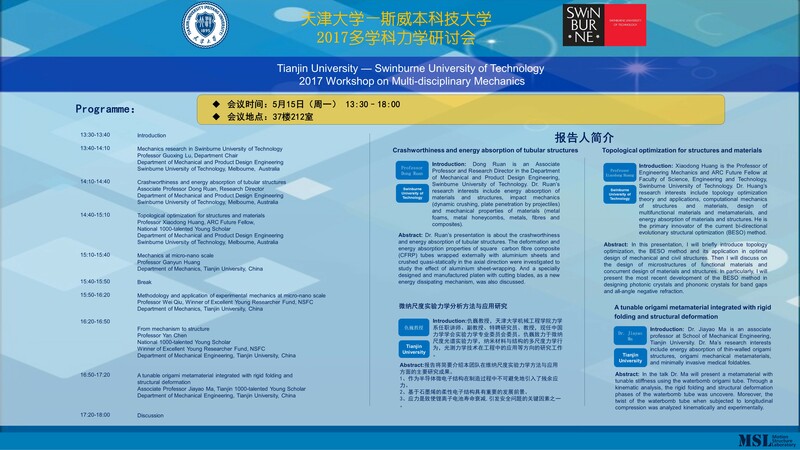 The 2017 Tianjin University- Swinburne University of Technology workshop on multi-disciplinary mechanics, proposed and organized by Professor Yan Chen from Motion Structures Laboratory (MSL), was held on 15th May, 2017 in Beiyang Park Campus, Tianjin University. Six experts on structures and mechanics from both universities presented their latest research outcomes, attracting over 50 faculties and students. 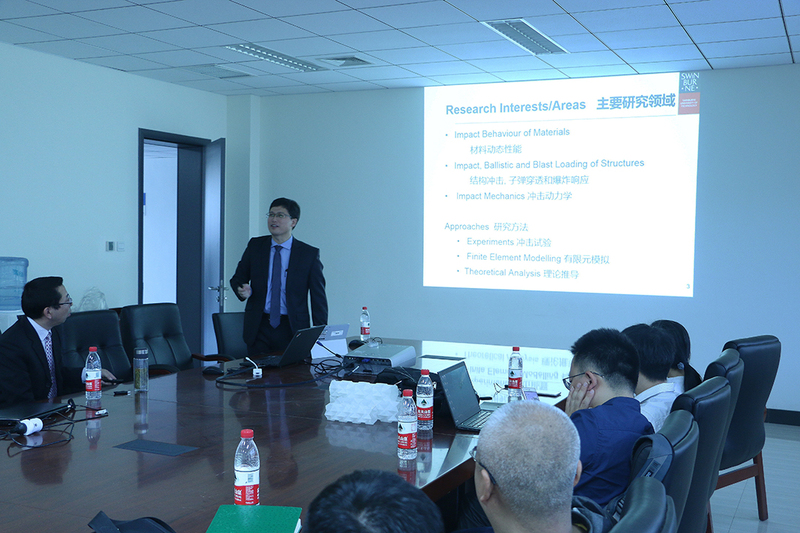 In the first session of the workshop, Professor Guoxing Lu, chair of the Department of Mechanical and Product Design Engineering in Swinburne University of Technology, Australia, first briefly introduced the research topics on structures and mechanics in Swinburne University of Technology. Then Dr. Dong Ruan from Swinburne University of Technology presented her work on crashworthiness and energy absorption of tubular structures, followed by Professor Xiaodong Huang’s talk on BESO topology optimization method and application. In the second session, Professor Wei Qiu from the Department of Mechanics in Tianjin University talked about his research on methodology and application of experimental mechanics at micro-nano scale. Subsequently, Professor Yan Chen gave a comprehensive overview of the research in MSL from mechanism to structure. Finally Dr. Jiayao Ma presented his latest work on a tunable origami metamaterial integrated with rigid folding and structural deformation. The presentations triggered great interest from participants and active discussion between participants and presenters, which will further promote collaboration between the two universities in the areas of structures and mechanics.